Distributed Denial of Service (DDoS) attacks are not new, but terms like diversionary DDoS, slow loris and application layer DDoS offer ample evidence that DDoS has evolved. Attackers are clearly becoming more sophisticated at launching DDoS... Have your methods for mitigation kept up? Likely not. During this information packed session we'll explain the trends in DDoS attacks and mitigation tactics giving you a path for tipping the security scales back in your favor. Register now to attend! The proliferation of mobile devices in clinical environments is taking the network and network security into a new and potentially vulnerable era. Many healthcare organization’s existing networks are unable to keep pace with this new demand and IT struggles to protect the infrastructure, end points, applications and data that underpin patient care. 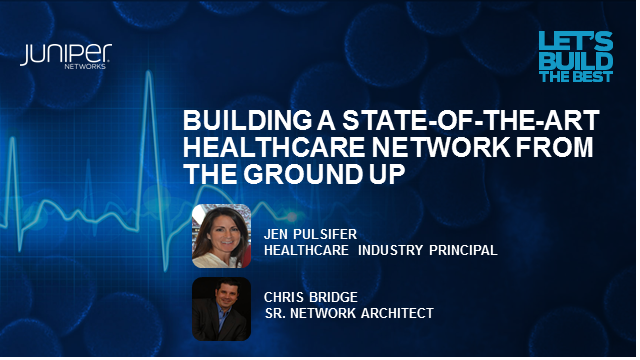 Join Juniper Networks and IDC Health Insights for this live webcast on secure mobility in healthcare. Lynne Dunbrack, a recognized thought leader in Connected Health IT Strategies, will present industry research to help you define an infrastructure framework for mobile transformation in your healthcare organization. Ryan Witt, Managing Director, Healthcare Industry Practice, will introduce Juniper’s solutions to help you build a future-proof mobile network while ensuring the right level of security and risk management for your information assets. Enterprises are looking at software-defined network (SDN) technologies and greater virtualization capabilities to improve application performance and agility in the data center. These solutions, however, won’t have the desired effect until something is done about the primary barrier to success: the network itself.